Todd and Martina have been riding Xtracycles since 2001. I knew they were cargo bike early adopters, but I hadn’t thought about the chronology or the details until I read the post. Everywhere we went, every 20th person would act as if struck by some soft lightning, either staring gape-mouthed, or shouting out to us in amazement that such things existed. I began to feel like a reluctant revolutionary, riding a magical unicorn of a bike. Give it a read and think about what you were doing in 2001. I know what we were doing (and it wasn’t riding bikes). In 2001 we had a brand new baby. Tim was commuting in a car by himself 40 miles a day. We owned 4 cars (one of them brand new). Yes, count em up, f-o-u-r cars. And we not-so-blissfully drove them all over the place. All the time. I habitually drove 5 blocks for a cup of coffee or a gallon of milk. I also sometimes strapped my baby in her car seat and drove around in my brand new car to get her to fall asleep. And our rackless fenderless sport bikes hung in the basement unused and collecting dust. The details of our story are still a bit fuzzy. But what’s crystal clear is that riding bikes and especially cargo bikes was not even on our radar in 2001. While Todd and Martina were blissfully riding their unicorn bike around San Francisco, we were begrudgingly filling up gas tanks, sitting in traffic while listening to NPR, packing on the pounds and drinking wine in front of the TV at night to “relax”. We were absolutely miserable and didn’t even think about doing it any other way. It’s hard to believe that it would be four more years before we began to realize that there could be another way than the cars-all-the-time-way. We did eventually wake up and bought ourselves a couple of life-changing bikes. But that is an entirely different story to be saved for another time. So thanks Todd and Martina (and Ross, of course) for your perseverance in waiting for the rest of us to get with the program. This entry was posted in alternative transportation, bigger than here, bikes, cargo bikes, family cycling, longbikes, sustainability, xtracycle and tagged bikes, cargo bikes, Clever Cycles, early adopters, old, xtracycle. Bookmark the permalink. Thanks for the link! Ugh…2001 was the year I was almost killed twice on the job (former long haul truck driver here,3-31 co driver wrecked me and my neck was broken twice,11-1 almost bled to death after an incident with the load and a split-down-the-middle index finger: BOTH within 50 miles of Richfield,UT),but was an avid mtn biker when home. Cargo bikes? 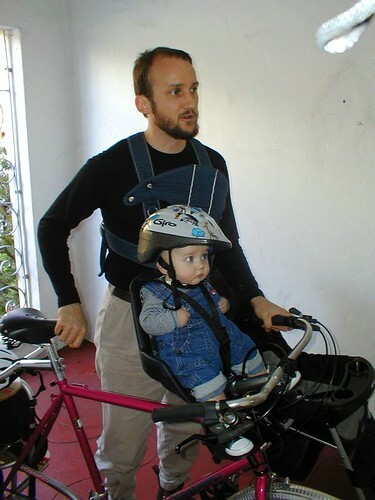 Didn’t know they existed until I saw a reveiw of Xtracycle in Dirt Rag a few years later. I wanted one from that point,but living out in the sticks where the closest grocery was a 30 minute drive,plus being gone all the time (trucking-I worked until pulled kicking and screaming out of work 12-08),there wasn’t much need for one. It would be March of this year (after a house fire last year forced us to move,and we moved in town) when I finally built one up. We’ve since moved (not by choice or at fault,but long story) a bit further out of town,so it doesn’t get ridden daily for errands,but has become my go-to bike-camper with my son. I LOVE my Xtra,and cargo bikes in general.